Eraserhead was director David Lynch’s first film. Beforehand, Lynch had wanted to become a painter, but switched his focus to filmmaking and attended the American Film Institution’s Center for Advanced Film, where he came up with the idea for Eraserhead, partially based upon his own personal experiences. Eraserhead is a mighty, powerful debut for Lynch and indicates his successful career he would have later on. Like much of Lynch’s work, Eraserhead is strange, surrealist, and very grotesque, mixed with terror as well as black humor. The imagery is powerful throughout the film and slowly pulls the viewer in with its hypnotic pacing. 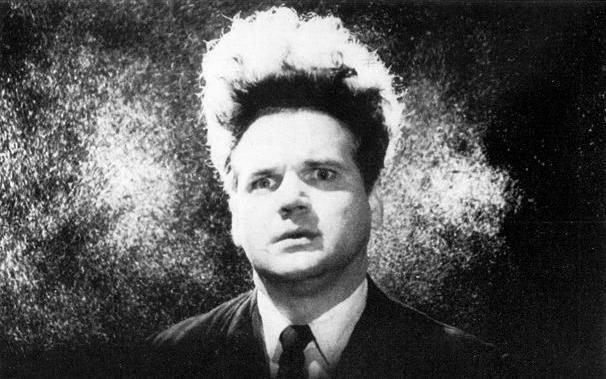 Eraserhead is about a young man named Henry Spencer (Jack Nance), a factory worker currently on vacation. On an invite to dinner with his girlfriend Mary (Charlotte Stewart) and her parents (Jeanne Bates and Allen Joseph), Spencer discovers that he has impregnated Mary, who has born a child. The baby was born premature and is heavily deformed, looking like a snake humanoid. Mary soon leaves Spencer in taking care of the child, which leaves him troubled as he does not know how to care for it. Lynch’s direction in Eraserhead reminded me of that of Stanley Kubrick, whom Lynch has said was a great influence on his work. Kubrick has stated before that Eraserhead is one of his favorite films and showed the movie to the cast and crew of The Shining to prepare them for the movie. Like Kubrick, Lynch adds a cold atmosphere to the film. The city in which Spencer lives in is a bleak environment, instilling fear upon the audience. Eraserhead is billed as a horror movie and while it is one, it does not rely on gotcha moments but upon tension to frighten viewers. The black and white cinematography and lighting emphasize the film’s disturbing mood and tone. Dialogue is sparse in the film with only a few lines actually uttered, which helps the dark feeling of the movie. To convey this frightening mood, Lynch relies on imagery and succeeds by doing so. He has fashioned the movie similarly to Mulholland Drive, but Eraserhead has a more avante-garde feel. The movie came out into theaters back in 1977 but its dreamy mood makes it feel more like a film from the 60s. There are also allusions to some of Lynch’s other work, including a scene that reflects the Black Lodge in Twin Peaks (Jack Nance would later play Pete on the show). Going back to the comparison to Mulholland Drive, Eraserhead makes the viewer question what is reality and what isn’t. Whole sequences of the film appear to be daydreams of Spencer. One such he imagines a disfigured woman stomping on miniature versions of his child. In another, Spencer discovers beastly figures in his bed and throws them against his own wall. The child plays great significance in the film. Lynch employs a puppet for it, which can one move its moth, head, and eyes. The child is wrapped in bandages and continues to cry throughout the entire film. Its presence is distirbing to both the characters and the audience members. The final scene paints a haunting picture in the viewer’s mind. Eraserhead is a fantastic movie, one that is shocking in its portrayal and subject manner and quite revolutionary. David Lynch has shown himself to be one of the most talented and unique directors of all time. This debut is quite remarkable and hints the fantastic career Lynch would have. Excellent review, I love a film that really makes you think. Yeah, it’s a fantastic film. Lynch is a great director. David Lynch’s alma mater was the Pennsylvania Academy of Fine Arts, so I’m not surprised he wanted to be a painter. However, the fine art he went with is so much more satisfying. I’d love to see Eraserhead, but I’ve recently lost time for even Twin Peaks. Aah! Great review. You can find Eraserhead on Hulu’s Criterion Collection page. It isn’t too long, about an hour and a half I believe, and is a great movie. It’s very similar in style to Mulholland Drive. I think you’ll like this one, it’s fantastic. Thanks for commenting. Is it free on Hulu? I just watched Mulholland Dr. Was a bit disappointed. I think so. You might need Hulu Plus to watch it. Sorry you didn’t love Mulholland Drive. I’m currently making a top 10 list right now and that’s actually pretty high up there. Great review! I must admit that I do struggle with Lynch’s work; I find it a little contrived at times and overly surreal (eg: Rabbits) but you mention that he wanted to be a painter and I can really see that in his films, particularly Twin Peaks and Mulholland Drive. I must try again and make the time to watch Eraserhead. Lynch’s work tends to be very polarizing. He uses heavy surrealism here, and this movie is undoubtedly not for everyone. I’ll be sure to check out your thought. Thanks for commenting. Wonderful movie, it’s been a while since I’ve seen it but that’s the kind of movie that sticks in your head for a while. Funny how Kubrick played it to the Shining cast, nice little tidbit. It’s a great film. I found out about the connection to The Shining recently and I can see it after watching this. Thanks for commenting. This is one of those movies that I disliked the first time I saw it, but then later changed my opinion of. It was my first Lynch film and I wasn’t ready for it at all. Now that I’m more acquainted with Lynch’s style, I find it a lot more enjoyable. Nice post! Thanks! It is one of David Lynch’s most distinct films. I haven’t seen too much by him so far, but I’d say this is my second favorite after Mulholland Drive. LOVE this movie. I feel compelled to go rewatch it, like right now. Excellent post! Thanks! It’s great and undoubtedly one of Lynch’s best. Nice review – I’m writing something about Lynch (assessing his greatness, so to speak) at the moment – and Eraserhead is certainly one of his finest films. Thanks! I’d say it’s my second favorite after Mulholland Drive, though I have yet to see Blue Velvet. Thanks! Lynch has made some great films and I’ve only recently really got into his works. Both this and Mulholland Drive are fantastic. I remember experiencing Eraserhead: It was the first movie I saw that 100% visualized the existential horror I’d read in Kafka, Sartre, etc. I think there’s a little bit of “Eraserheadness” in Aronofsky’s first flick Pi. I can see Lynch’s influence on Pi. It really is a different kind of horror film and shows how great of a director Lynch is. Thanks for commenting.